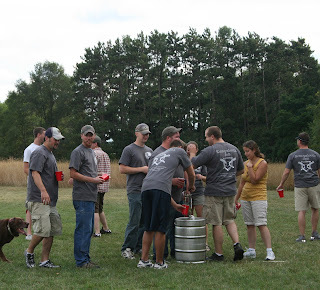 Last weekend was our annual party, Konopalooza. We had a really good turn out this year; I think my last count was 53 people at one time or another throughout the weekend. This party started when Collin was in college and all his friends from Milwaukee would spend the 3rd weekend in August up at his parent's house. When we moved up here and built our own house we moved the party location, changed the date to the weekend after Labor day, and gave it an official name. It always begins on Friday evening and lasts throughout the weekend. Activities vary from year-to-year but a couple of things are always certain. Flippy cup game on Friday night, drunken wiffle ball at 3pm on Saturday, and a big bonfire Saturday night. Everyone brings their tents or pop-ups and sets up camp for the weekend. Our only requirement is that you relax and have fun. During the 1st annual in 2006 as I was carting food back to the house around midnight I remember thinking there is NO WAY I could do this while pregnant. It was so much work, I was exhausted, my body was in pain, and I was practically in tears. Thankfully, we've worked out alot of the kinks from that first year and although I was still exhausted by Sunday I have to say putting this on while pregnant went much, much better than I could have planned. This is in large part because we have amazing friends and family that are always asking what they can do to help. So to all of you, thank you! So much. I didn't take as many pictures as I would have liked this year and after everyone left on Sunday we realized we never got our annual group shot, but I did take a few and I thought I'd post some here. 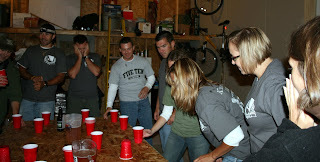 Here's one of the flippy game in action. I believe this was a 16 person game, but later in the night I think they got it to over 20. Note Justin, who is in the back on the left hand side, this is one of MANY pictures I have of him with his head in his hands in agony over the fear of defeat. I love the look on every one's faces in this shot. This is serious business! Each year we get shirts made that have a quote from the prior year. 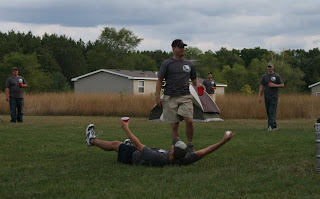 This year's winner was Mullins with "We don't come here to win; we come to drink beer." Although it rained Friday night, Saturday's weather was nice, cool but sunny. 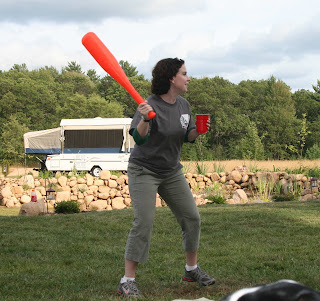 Perfect for drunken wiffle ball. Fill 'er up! 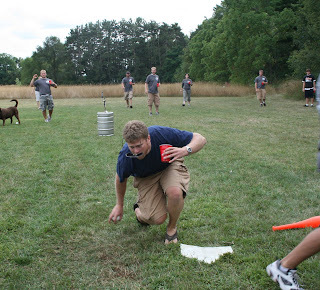 If the other team hits a home run everyone in the outfield has to drink and then hit the pitcher's mound (a/k/a keg) for a refill. Here's a couple of action shots. Notice how everyone is protecting their cup. 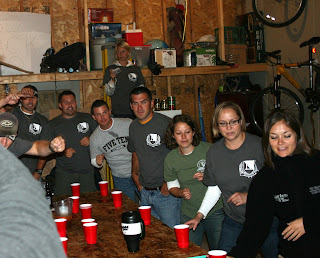 Everyone has to have beer in their cup at all times or your team has to drink. Marc making a diving catch. A big thank you to everyone who came out last weekend! For those that couldn't make it, we missed you and hope to see you next year! Looks like a great time! I love how the shirts turned out. And I'm glad you survived, despite your "delicate condition." :-D Go mama! Looks like everyone was having a great time - I love the shirts too! I'm glad it went well! 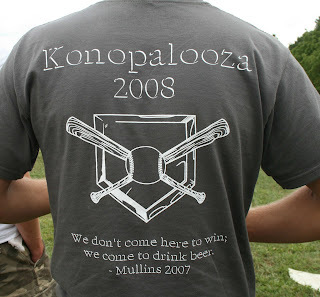 Ummm....Konopalooza looks like one hell of a good time. I'm thinking that maybe after we are reading each others blogs for 5 years or so I'll invite myself up to party with you. I'm sure you won't be disappointed in my ability to drink beer like a WI native. I love the annual t-shirt complete with quote! Also, you are looking so good in your pregnancy shots so healthy and happy! Congratulations again!